Police describe the five -- two Pakistani-Americans, two Yemeni-Americans and an Egyptian-American -- as college students. Islamabad, Pakistan (CNN) -- Five Americans arrested last month for allegedly plotting terror attacks told a court Monday they have been tortured while in custody. Muhammad Ameer Khan Rokhri, the former defense lawyer for the accused, told CNN Monday the five complained to the special anti-terrorism court that they were tortured by the jail authorities. He added that the court ordered medical check-ups for the five. Aftab Hanif, the deputy superintendent of the district jail, told CNN that the allegations were false. He said nobody touched the suspects and added that they were even receiving better food than the other prisoners. 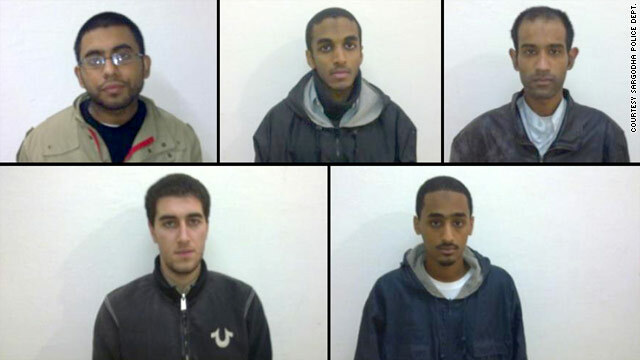 The five are identified as Ahmed Abdullah Minni, Umar Farooq, Aman Hassan Yemer, Waqar Hussain Khan and Ramy Zamzam. They were arrested in the small city of Sargodha in December. Rokhri said the five told him they didn't want to him to represent them any more but would like Human Rights activist Khalid Khawaja to be their defense counsel. Khalid Khawaja is not a lawyer. He is a former member of the Pakistan intelligence service and founder of "Defense of Human Rights," a Pakistani Human Rights organization based in Islamabad. Rokhri said the court has allowed the accused to hire any lawyer for their defense and adjourned the case until February 2. Police provided the public prosecutor with a list of the allegations and evidence against the five Monday, said Chaudhry Muhammad Jahangir, chief public prosecutor of Punjab province. The prosecutor has three days to decide whether there is enough evidence to press forward with a trial, Jahangir told CNN. If the prosecution believes that the material provided by the police is sufficient, then a charge sheet will be submitted to the Anti-Terrorism Court and the court can formally charge the five at the February hearing, he said. Pakistani authorities have described the men as college students who "were of the opinion that a jihad must be waged against the infidels for the atrocities committed by them against Muslims around the world." The suspects include two Pakistani-Americans, two Yemeni-Americans and an Egyptian-American.